My husband’s parents generously gave us some old furniture they no longer needed after their move to the beach. (I wish I could move to the beach.) One piece was an old cabinet. It has one drawer and two doors underneath. 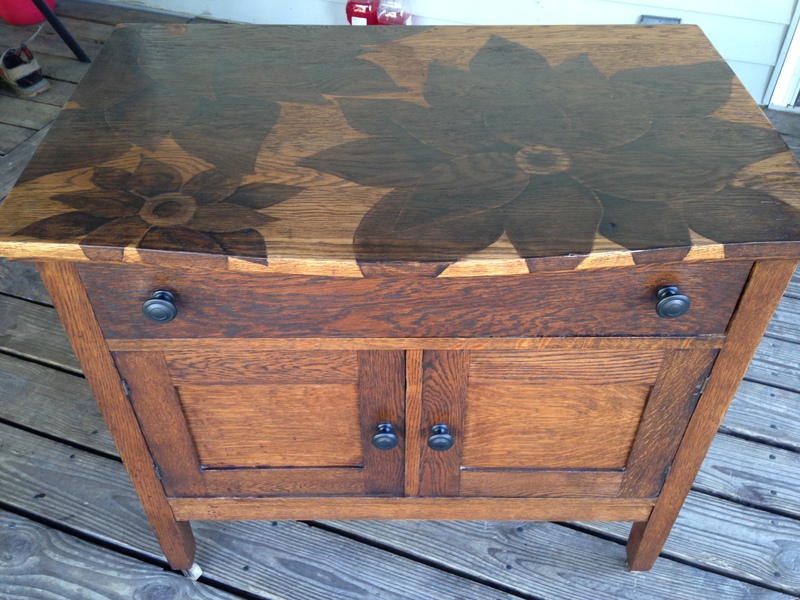 It was in need of refinishing and looked pretty worn. (see before photo) I asked first to make sure my Mother-In-Law had no objections. Better to know that ahead of time. This project evolved many times. 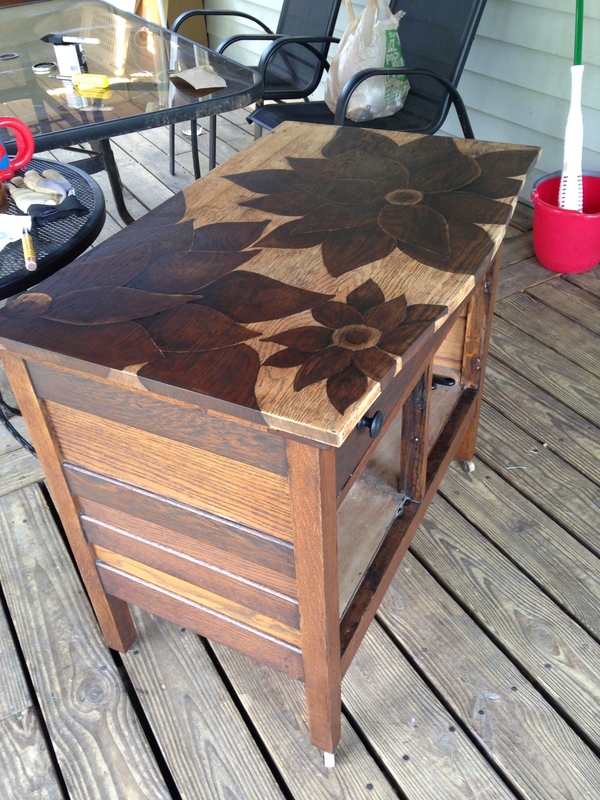 At first I planned to just sand it down and refinish it with a dark color. Then I was going to paint the whole thing red. After that I was going to paint the cabinet red but refinish the top to show the wood grain. Each step changed my mind. After sanding the whole cabinet, I could see that the grain was really nice and it would not show if I painted it. I chose a walnut stain color. It was at this point that I decided to put a design on the top. There was a stain that would not come out in the shape of a circle and I thought that would make a great flower center. And so it began. I ended up using an ebony stain for the shading. With stain, the longer you leave it on, the darker the color will be so you have to judge how long to wait before wiping off the stain. This part takes the longest because you have to keep adding stain until you get the design where you want it. 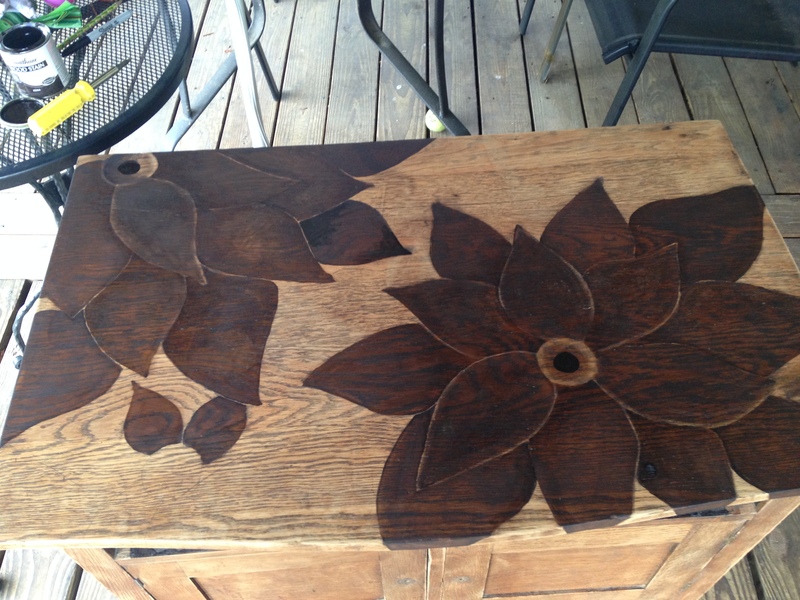 I used small paint brushes for the flowers so that I could control how much stain went in certain areas. 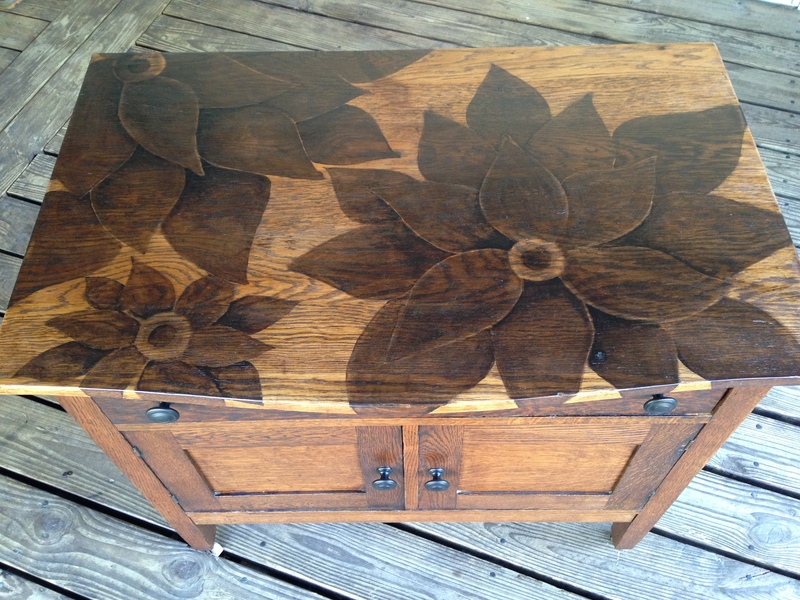 Using a clean cloth, I just wiped off the stain in an outward direction from the inner parts of each petal. In order to keep the light original wood color, I had to coat the entire top with clear polyurethane after the design was complete. The whole project took 2 days, over the weekend. After some new knobs and stain on the rest of the cabinet (after a good sanding), the finished cabinet looked amazing. Fortunately my Mother-In-Law thought so as well. The poly really brought out the nice wood grain and now the piece is a beautiful addition to our family room. Thanks for explaining how you painted the flowers. I may experiment with some scraps I have to see if I can get the technique down. You should! I think it would make interesting wall art too. Doesn’t have to be flowers. Let me know how it turns out. 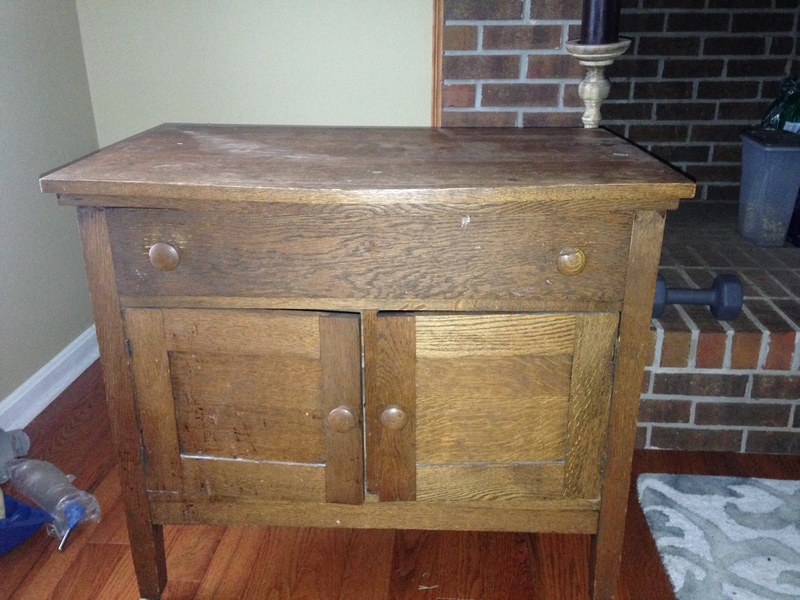 It looks like a piece by Gustav Stickley, or a reproduction, though the top is certainly not as common. But if I know anything it is made from quartersawn oak, which is another indicator that it may be a Stickley piece. If you get a chance you should research it; it could be valuable. Thanks Bill! I will look into that. Either way I am happy to have it in our home.